Today is the Feast of the Guardian Angels. I just think this is such a special day at the end of a wonderful week of Holy Feasts! I've asked all of my children to remember their Guardian Angels today - and don't make them work too hard today!! We'll also have some more Angel Food Cake today and I think Mr. Pete wants some hot carmel to spread over his. 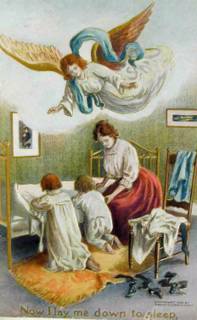 Remember to thank your Guardian Angel today for all of their prayers and guidance.